System Tools Guide & Faqs - Registry Tools, System optimizers, disk management etc. Zune Music Recovery Software Guide - Recover or restore music(aif, aac, mid, midi, mpa, wav and wma), mp3, mp4, pictures, video files and folders lost due to accidental deletion, corruption, formatting and improper handling of your zune digital music player. iPod Data Recovery Software Guide - It helps you to recover and retrieve your lost Mp3 Music, Photo, video, pictures, songs, images, file, folders and all previously existing data on your iPod digital media player(iPod mini, nano, shuffle...). XLS Regenerator Guide - Download XLS Regenerator to recover lost, damaged, deleted, overwritten Microsoft Excel documents in a special and efficient way. HDD Regenerator Guide - A powerful hard disk tool that can detect and repair physical bad sectors on a hard disk drive surface and regenerate hard disk. DOC Regenerator Guide - Download DOC Regenerator to recover lost, damaged, deleted or overwritten Microsoft Word documents. Power CD DVD Recovery Guide - It can recover lost and deleted files from damaged, scratched or defective CD and DVD (CD-ROM, CD-R, CD-RW, DVD-ROM, DVD-R, DVD-RW, DVD+R, DVD+RW and DVD-RAM) discs and RW disk. Photo Recovery Genius Guide - Recover *.tif, *.tiff, DWG, GIF, JPG, PNG, PSD, CDR, PSP, PCX, BMP, AVI, MP3, WAV, WMF, EMF photos and video from digital cameras, hard drives, CD/DVD disks, mobile phones, flash cards. Parallels Desktop for Mac Guide - irtualization software for Intel-based Macs, which enables you to run Windows, Linux, and more side-by-side with Mac OS X.
Innovatools Add/Remove Plus Guide -All you have to do is double-click on a Desktop icon called "Uninstall Programs", quickly find the program you want to uninstall and click a button. Synchromat Guide - A Windows data synchronizer that can synchronize your data between desktop PCs, laptops, USB drives, flash keys, MP3 players, digital cameras and more. 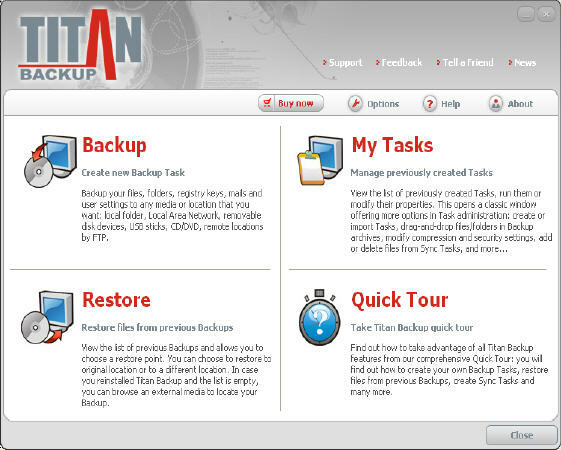 Titan Backup Guide - The ultimate backup solution - Secure, Automated, Easy-to-use backups of your important files and documents, emails and rules, registry, settings.Features 256-bit AES encryption to ensure full security of your confidential data. Argentum Backup Guide - With Argentum Backup, you can simply create a number of tasks with files on your computer, which you want to copy to the backup store. Cute Reminder Standard Edition Guide - Remind you of information, ideas, notes, schedule, important data and appointment, etc, in time. 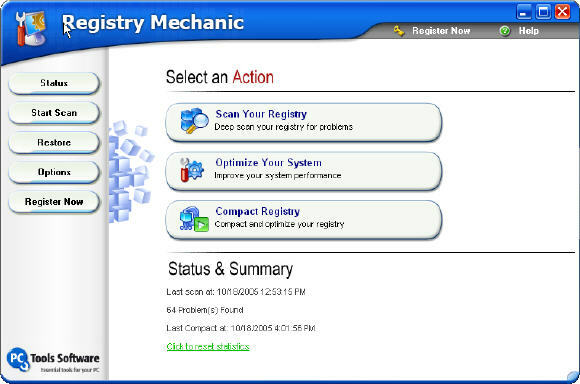 Registry Mechanic Guide - Clean and repair problems with your registry, and fix common causes of crashes and error messages. WinTasks 5 Professional Guide - A set of tools that can enhance the protection against system security threats while dramatically increasing computer performance. Intelli HyperSpeed Guide - help you optimize system by fixing programs caused by low memory, unnecessary background processes, junk registry, etc. WinBackup Guide - Secure all your valuable data, Backup emails, address books, bookmarks, digital images, financial documents and other records. FILERECOVERY for Windows Guide - Recover deleted files from all types of media such as Hard Drives, Floppy Drives, SmartMedia, CompactFlash, Memory Sticks, etc. Registry Medic Guide - Detect and remove system errors, repair registry entries, remove invalid registry entries, and eliminate Trojans and other harmful viruses. SpeedUpMyPC Guide - Automatically fine-tunes all your resources including hardware, system settings and Internet usage to operate at peak performance at all times. Absolute Uninstaller Guide - Wipe off all junk files and unneeded applications clearly, backup and restore applications information. MagicTweak Guide - Optimize and personalize Microsoft Windows, tweak almost any aspect of system, optimize internet connection speed, control startup items, etc. Advanced XP Tweak Guide - Tweak and optimize your Windows XP system, Internet Explorer, automatically manage your system resource as the task performed often or not. GeekAlarm Guide - Prevent repetitive strain injury, carpel tunnel syndrome, and computer vision syndrome by reminds you to take breaks at selected intervals. AttributeMagic Pro Guide - Change any file or folder date/time stamps and attributes, such as MS Office documents, JPEG file metadata, etc, and batch rename files or folders. Driver Magician Guide - Identifiy all the hardware in the system, extracts their associated drivers from the hard disk and backs them up to a location of your choice. Registry First Aid Guide - Scan the Windows registry for orphan file/folder references, and find these files or folders, and corrects your registry entries to match them. ZoneTick World Time Zone Clock Guide - Display the times for any amount of different time zones of the world in the place of the normal Windows clock. Active Desktop Calendar Guide - A desktop calendar that has notes, tasks, alarms, and displays its data on your desktop through blending with existing wallpaper. Disk Clean Wizard Guide - Find and remove temporary files, recognize and delete more than 50 types of junk files to clean up your disk. Auto Backup Guide - Automatic backup your critical data to a local disk, do integrated encryption, compression, and can use password protection. digital photo recovery Guide - Recover or restore your lost photos, files, and data from all media types. DiskInternals Flash Recovery Guide - Restore all corrupted and deleted photographs or the ones lost due to hardware malfunction. System Mechanic Guide - Find and fix errors, clean up junk and debris, optimize Internet and download speeds, ensure personal security, and maintain your computer for peak performance. Smart PC Guide - Fix stubborn errors, clean up space-wasting junk and optimize Internet and download speeds making your PC more efficient and reliable. Nucleus Kernel Excel File Recovery Guide - An Excel recovery tool that can repair corrupted or damaged files, which fail to open due to virus attacks, unexpected system shutdown etc. R-Excel Recovery Guide - Recover corrupted Microsoft Excel Sheets, reconstruct damaged Excel files and restore lost Excel sheets quickly and easily. Easy Macro Recorder Guide - A desktop automation and recorder tool that can record all the mouse and keyboard operation, with your accessed application. Exe To Service Guide - A professional software that lets you install any Windows executable, VB script or Java script as a service. MD5 Checksum Verifier Guide - A MD5 algorithms based files integrity checker, with which you can create checksums of files and verify their integrity afterward. PC Auto Shutdown Guide - Automatically shutdown, power off, reboot, hibernate, suspend or log off computers at schedule time you specifies. R-Drive Image Guide - Create disk image file and enable to restore from the image, create startup disks, copy a disk to a disk and so on. Space Hound Guide - Eliminates duplicate and unused files that are cluttering up your hard drive and causing problems. R-Studio Data Recovery Software Guide - Recover data from FAT12/16/32, NTFS, NTFS5, Ext2FS (Linux) file systems both on local disk and remote computers over the network. Clip Plus Guide - An easy to use and powerful clipboard extender, which allows the clipboard to store a paltry 12 items.